I just released a new major version of my ESXi-Customizer-PS PowerCLI script that greatly simplifies and automates the process of creating fully patched and customized ESXi 5.x installation ISOs using the ImageBuilder snapin. Recently William Lam announced the availability of a VIB package that installs VMware Tools inside an ESXi host. This is very useful if you run virtualized (or so-called nested) ESXi hosts on a real physical ESXi machine, because then you can reboot the nested ESXi host using the vSphere client (connected to the hosting physical host). The package also implements the VIX API that you can use to trigger scripts running inside the nested ESXi host. The VMware Tools for nested ESXi are provided as a VMware Labs fling. While it is very useful it is currently only available in the format of a VIB file. William correctly pointed out that you can use my ESXi-Customizer tool to build an ESXi installation ISO with the VIB file included (and Vladan wrote a nice walk-through of how to actually do this), but there are situations where you need to have the package available in the format of an Offline Bundle: E.g. when you want to build a customized ESXi installation ISO using PowerCLI ImageBuilder, or if you want to create an ImageProfile for vSphere Auto Deploy (and this is a must in my test lab ;-). So, how can you make an Offline Bundle from this VIB file? With the release of its Backup & Replication product v7 Veeam finally added a feature that was repeatedly requested by a lot of customers although it might appear anachronistic to a lot of people: Tape integration. Today the primary backup target media is hard disk storage: Backup-to-disk allows not only for super-fast backup and (more importantly) restore, but also enables cost-saving features like de-duplication and compression of backup data. Virtualization-aware backup products like Veeam's even allow to start a VM directly from the backup storage without restoring it to the original location at first. Tape though has still a right to exist: It is by far the cheapest, densest and most durable backup media, and it is removable. That means you can easily ship it to a safe location and/or use it for archiving. In certain industries there are regulatory requirements to keep data for up to 30 years - you won't use hard disks for such archives, but tape! In this blog post I'm going to demonstrate the tape integration of Veeam v7. Since I do not have a real tape drive or even tape library available in my lab I will use a Virtual Tape Library (VTL) software, specifically the free QuadStor OpenSource VTL. With a VTL you do not use real physical tape drives, but hard disk space to emulate these. 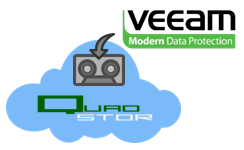 I personally do not see much value in using VTL software with Veeam, because it already does an excellent job in storing backups on hard disks, but for demonstration purposes Veeam v7 and the QuadStor VTL make up a really good combination. And it allows me to introduce both products at the same time. In ESXi 5.5 VMware removed driver support not only for some commodity network cards, but also for lots of SATA controllers that have never been on the HCL, but worked fine with the generic ahci driver of ESXi 5.0 and 5.1 (provided that they support and are configured for AHCI mode). 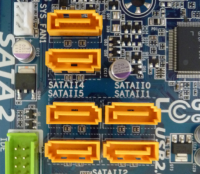 For the NICs the problem could easily be solved by using the old ESXi 5.1 drivers with ESXi 5.5, but - until recently - I had no idea how to fix the issue for the SATA controllers.